Bennett Park, on the east side of Pine Street between Clinton and Eagle Streets, sits nearly unused. A pair of tennis courts and a few isolated park benches are all that hint that it is not simply a vacant lot marring a revitalized community with dozens of newly built homes. Bennett Park was named for the property owner from whom it was acquired by the city. 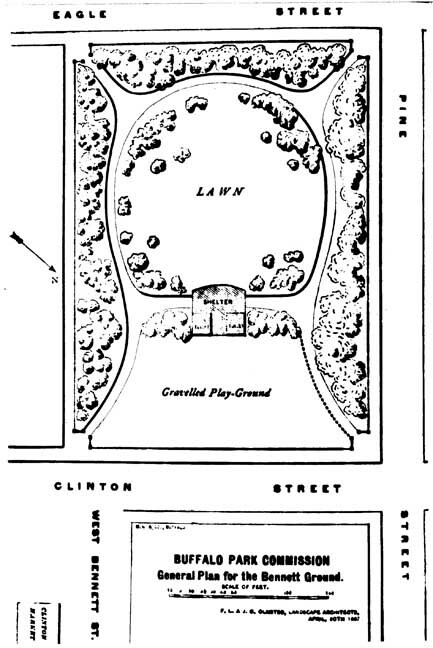 Olmsted's design for the park called for entrances from each corner of the property, with flagstone walks encircling a lawn of horseshoe shape at its center, a shelter house facing toward Eagle Street, and a graveled play ground adjacent to Clinton Street. Thick plantings screened the park on from the streets, and helped conceal from the visitor that the site was relatively small. 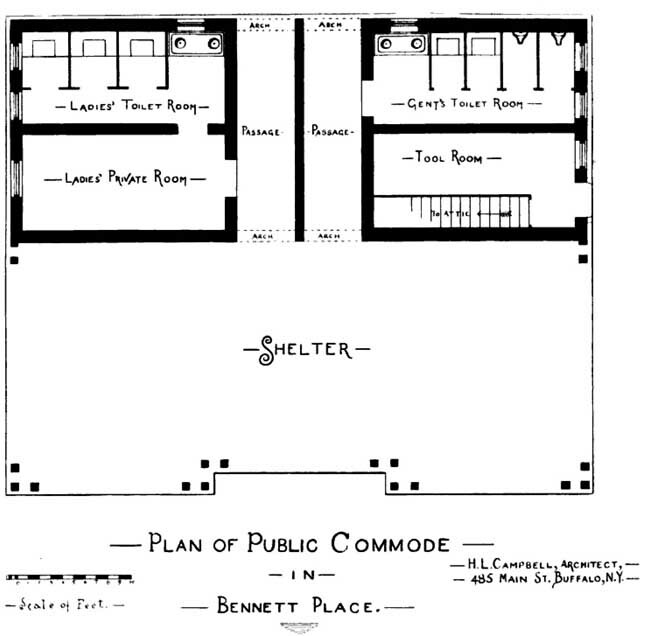 The shelter house was constructed in 1888, and was designed by H. L. Campbell, who had designed a number Buffalo park structures of the period. It was a brick gabled structure, trimmed in stone, with flagstone floors. 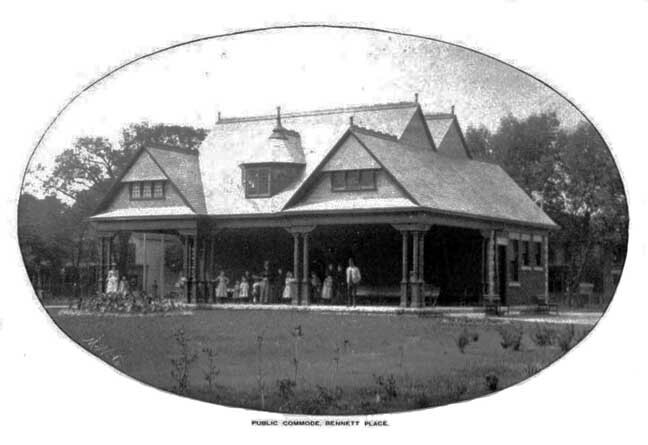 It housed restroom facilities and a tool room, with a large covered space open on three sides to protect park visitors from the elements during inclement weather. A large storage area, the full size of the building, was provided under the gables. 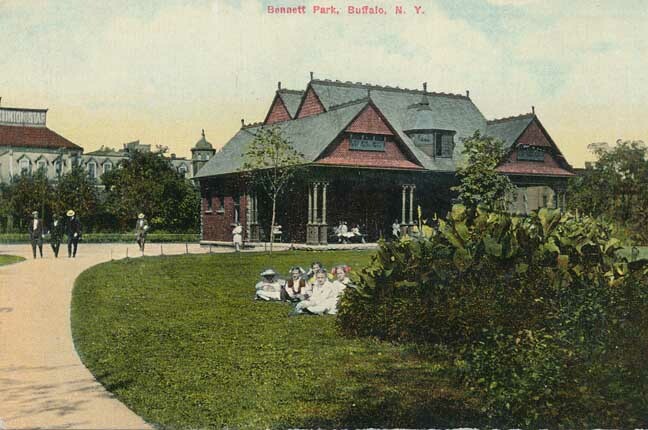 Bennett Park quickly became a very popular attraction, as it was located in a densely populated area of the city, and was quite distant from any other city park. Eventually, it effectively became incorporated into the large John F. Kennedy recreation area built by the city to its north and west.